Whether they are a result of some medical procedure, an injure, or self-harming, scars are there to remind us something. Some people show them with pride and some hide them, feeling ashamed of that past. But these 50 particular cases are amazing. 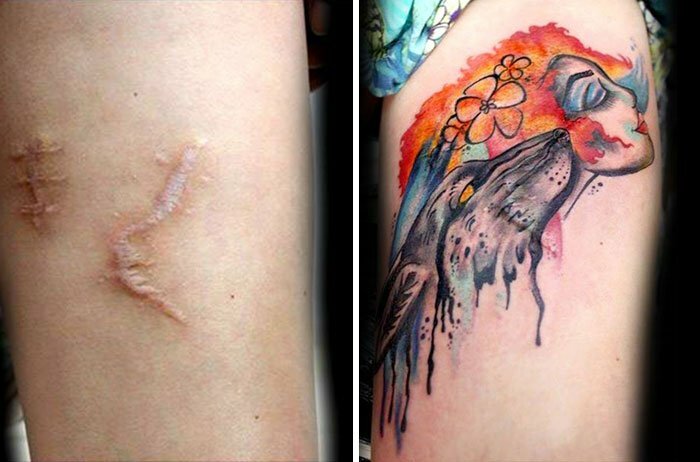 They decided to cover the scars of a painful past with some beautiful art. 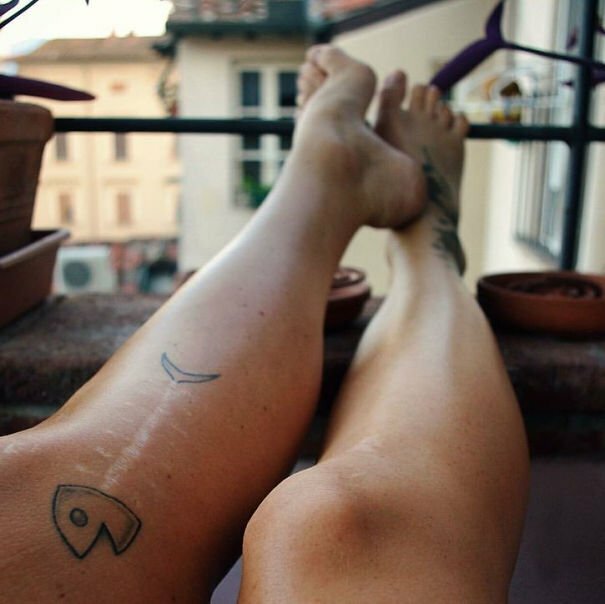 Take a look at these inspiring stories that prove that sometimes a tattoo has more meaning than we think. 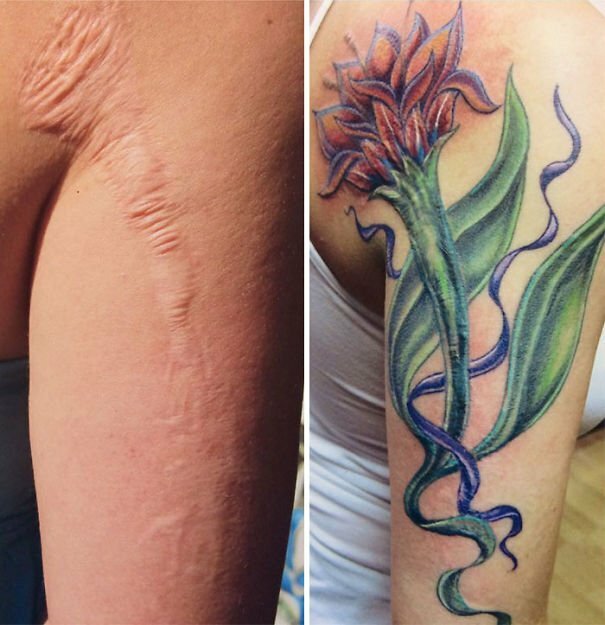 They had scars on their bodies and they decided to turned them into something beautiful. He suffered a severe dog bite as a child. So bad, in fact, that the scar stuck with him into adulthood. You can still see the scar but it is an amazing cover-up job. This shield is a constant reminder that scars only make us stronger. Everything that happened to us in the past left a mark that hardens your mind, your heart and your skin. This one was inspired by The Beatles “Blackbird” song, specially the part when it says “Take these broken wings and learn to fly”. 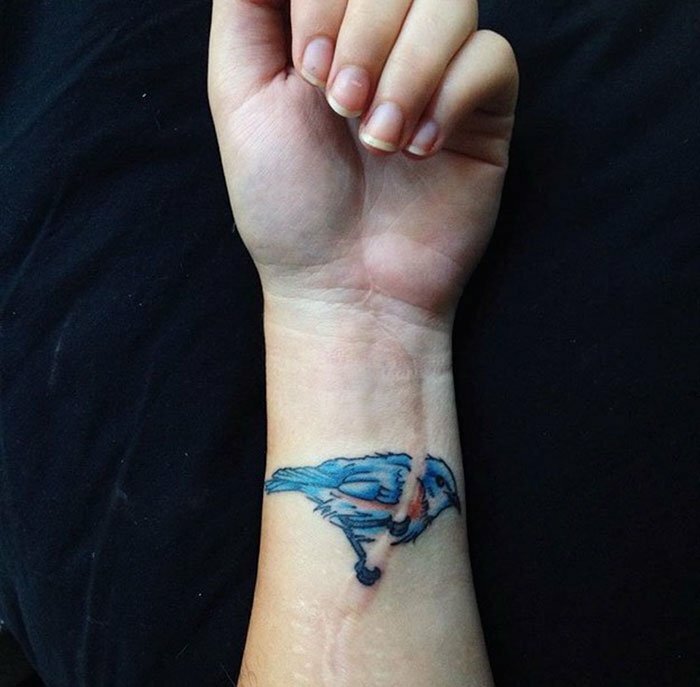 This tattoo covers the scars of self-harm. This tattoo has many meanings. It covers some self harm scars and it is also for this girl’s grandma, who passed away recently. She wanted to make her always proud. She wasn’t ashamed of them, she even saw them as a reminder of her past. But she was tired of people asking her about her scars so she decided to cover them up with these gorgeous flowers. He suffered much as a teenager. This willow tree, a symbol of adaptability, turns those self-harm scars into a beautiful and inspiring piece of art, leaving depression and anxiety far behind. This is a severe case of scarred skin, that was transformed into a gorgeous piece of art. Actually, the scars give the tattoo some texture and make it even more impressive. He had Hodgkins Lymphoma when he was 21 and because of the late diagnosis, he had to stay in the hospital for several weeks. When he beat cancer, he chose this to cover some of the scars. It was the first thing he draw after healing. This guy covered this scars in his arm with this amazing Superman logo with mechanical parts and the edges burned. Doesn’t it look amazing? You can’t even see the scar! While suicidal, this person self-mutilated by burning their arm with a lit cigarette every day. This beautiful rose tattoo represents growth, while being a reminder of what they went through. Her grandfather abused of her when she was a kid and she started to self-harm. 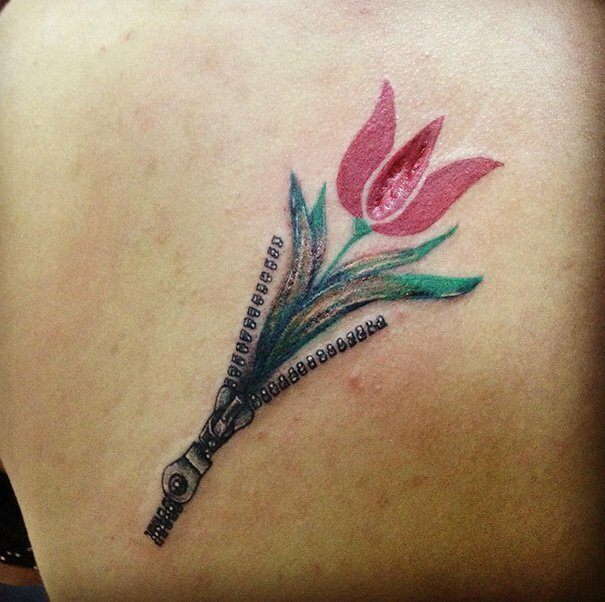 When she grew up she did this tattoo, which symbolizes that something beautiful is growing where something ugly used to be. She used to show her scars with pride, to let people know that she has overcome the bad moments in her life. But then, she decided to turn the scars into something artistic and beautiful. She lost a bet at high school and let some kid burn her arm with the metal end of a lighter. 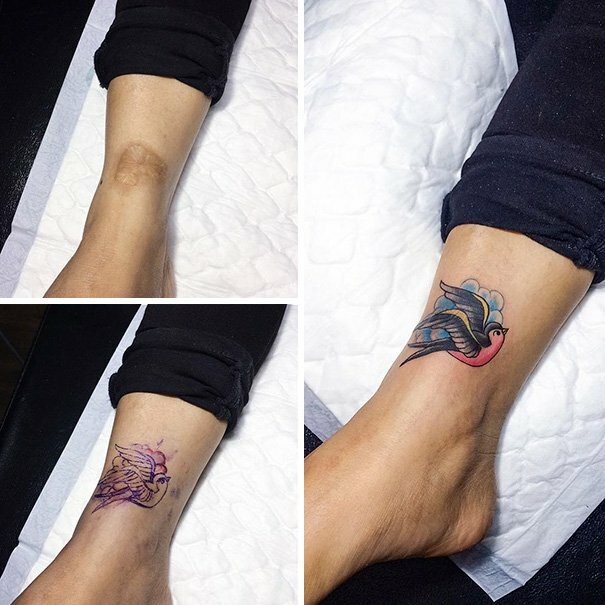 That left a noticeable scar that was turned into this stunning abstract and colorful tattoo. She fell from a motorcycle when she was ten and broke her femur. Those scars were supposed to vanish but that never happened, so she ask for this tattoo of a heart to cover them. This guy was scratched by a cat and got Cat Scratch Disease. He decided to have a bit of humor and covered the scars with this funny scratching cat to cover the pain from the past. This one covers the scars from an abusive relationship. She made it to remember those times when she felt weak. Also that she must always be strong in the future and that even horrible things can be turned into something beautiful. Phoenix is a symbol of new life. This scars in this girl’s wrist are from self-harming. She recovered from depression and anxiety and finally got this to forget but also to remind. Sometimes people don’t want to cover the scar, but to make it notorious and a reminder of a hard time but also a good time, when they fully recovered and began a new life. This girl fell off the trampoline in senior year and broke his left arm. 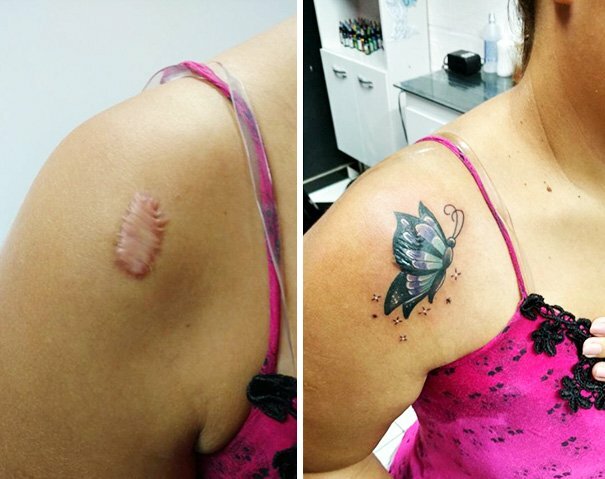 Several surgeries left scars that deformed her arm, so she decided to get this tattoo to turn something broken in something beautiful. 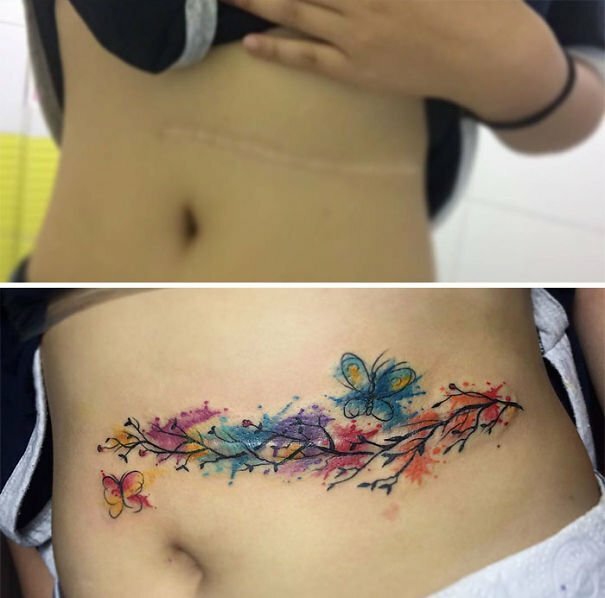 This tummy scar was covered by this beautiful flowers and butterflies painted with a watercolor effect. Doesn’t it look stunning? You can’t tell there’s a surgery scar in that photo. “I had a tumor in my knee and it was removed when I turned 10. 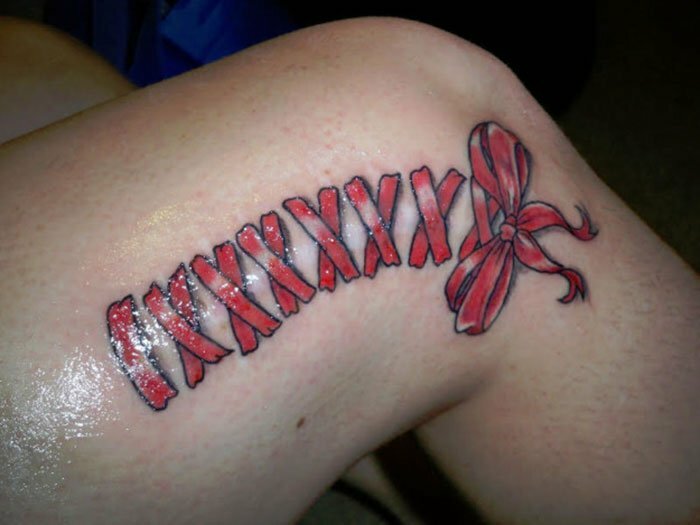 This bow and tie bind me where they removed it” said this woman about her tattoo. This impressive tattoo was made by an irish artist that uses the texture of the scars and integrates them to the design people choose to have forever painted in their skins. Her appendix exploited and filled her body with toxins. Doctors had to cut her open to “clean her up”, leaving a big scar. She had to wait three years to get this tattoo. This girl has this tattoo to cover a big scar she had since a surgery where they took a cyst of fat out. It’s a tulip from Hungary with a zipper. This scar is the product of an intervention doctors did to this girl to help her control the liquid pressure of her brain. It was like having hydrocephalus. 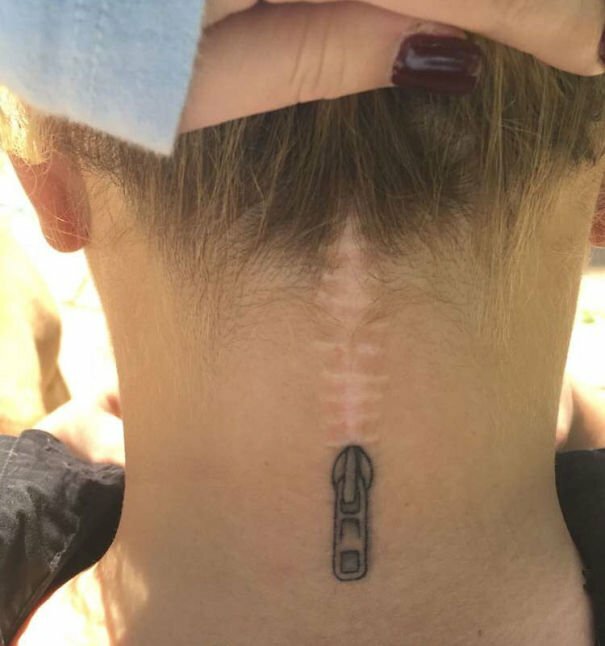 She took advantage of it and got this tattoo of a zipper. A swallow is a symbol of wealth, abundance, fidelity, wellness and freedom and this young woman got this tattoo to cover a burning scar on her feet. It looks incredible! A keloid is formed by an excess of protein (collagen) in the skin during healing. 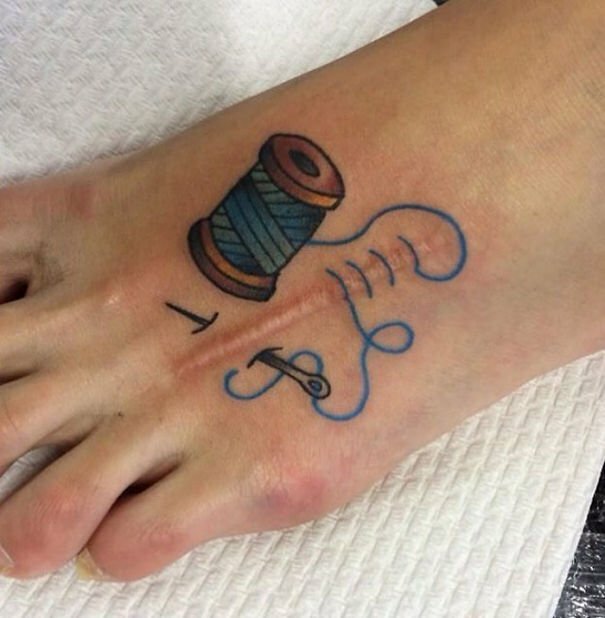 She wanted a tattoo to accompany her all her life, so she decided to get this one. This is a beautiful pink flower growing strong in the same place a baby was born recently. 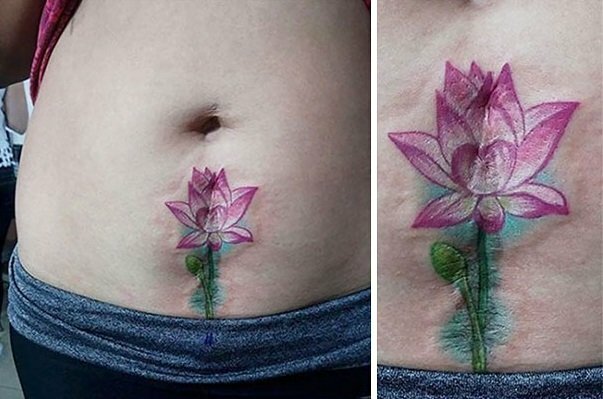 A nice and clever way to cover a big cesarean section scar. Amazing! Morton’s Neuroma is the thickening of the tissue surrounding a nerve leading to the toes. In this case the best way to fight it was surgery, and this tattoo goes perfectly with the scar. 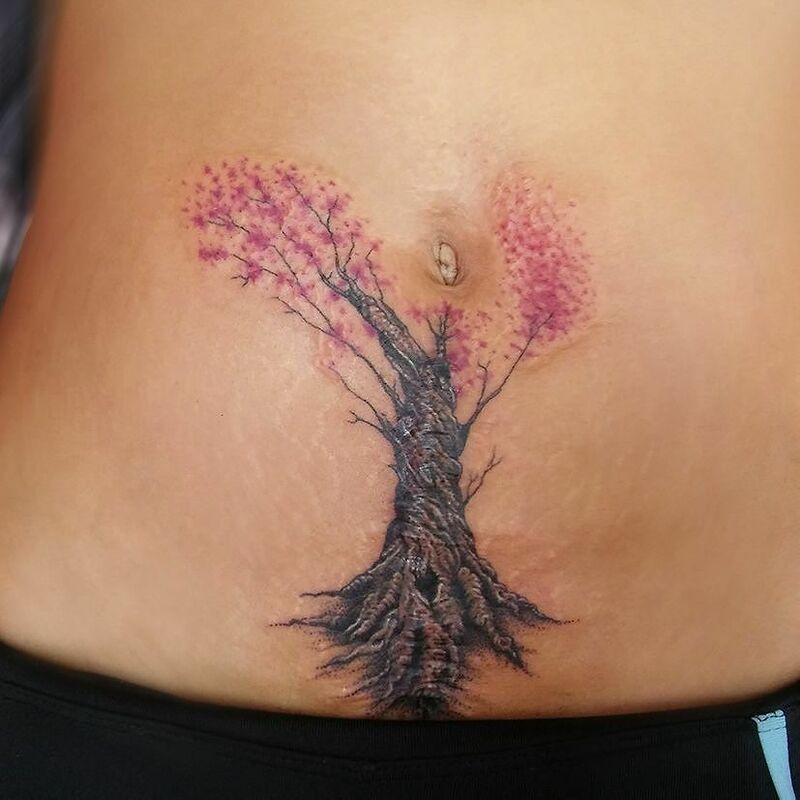 A huge detailed tree that grows on a cesarean scar. The branches and flowers are complemented by the marks of the striae generated during pregnancy. A beautiful way to remember a beautiful moment. 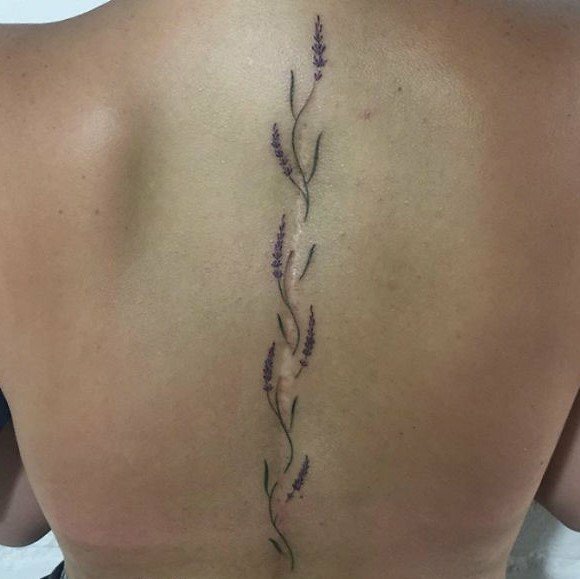 She had a spine surgery and though the scars are now vanishing she decided to get this awesome tattoo of a lavender bouquet that goes all the way from the lower back to the neck. This is beautiful because it actually looks like a cocoon that grew into a flying butterfly. And the finished work is perfect, there is no clue of the scar underneath. She fell very hard while running in the rain and broke her arm. 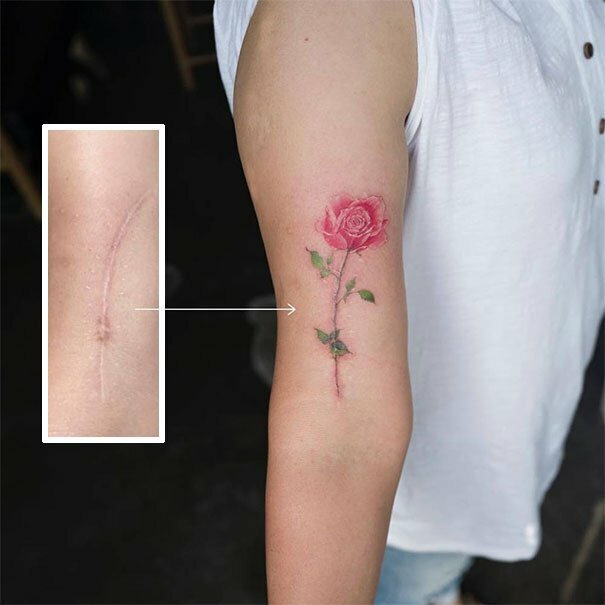 The doctors then had to do more than ten stitches and she covered the scar with this incredible rose. This woman’s ex husband arranged a meeting with her and then stabbed her several times in the abdomen with a knife. She covered the scars with this colorful girl with a wolf. This is actually a birthmark, but it was covered brilliantly and turned into an aquatic turtle. A great way to cover marks that you don’t like and you can’t fully erase. This two carrots do their job perfectly. Can you see any old burning scars in that arm? Exactly! And it is also a cool and original idea for a tattoo. This is fun and perfect. 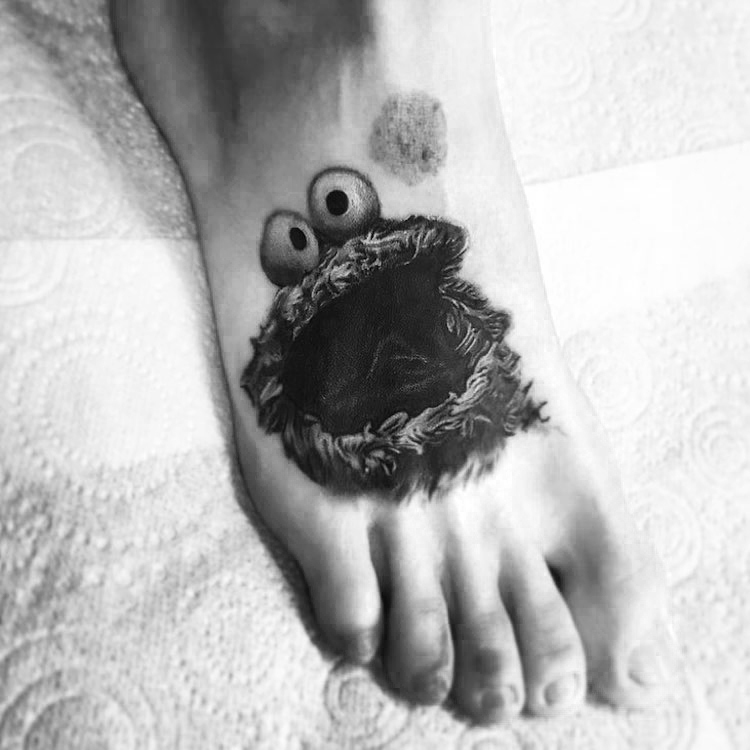 It seems like that ultra realistic cookie monster is eating that scar that looks like a cookie. It takes a lot of humor to turn pain into something amazing and hilarious. This girl had a mass removed from her left ovary. She then got this tattoo not to cover the scars but to highlight it, so she can always remember how lucky she is to be alive. She used to cut herself when she was younger and she cut this heart into her hand. When she grew up she decided to trace it with white ink to highlight it and always remember to love herself. After a bone marrow transplant that left her some scars and the death of her grandpa, she decided to have this tattoo done. It is an anchor to remind her to stay grounded and down to earth. 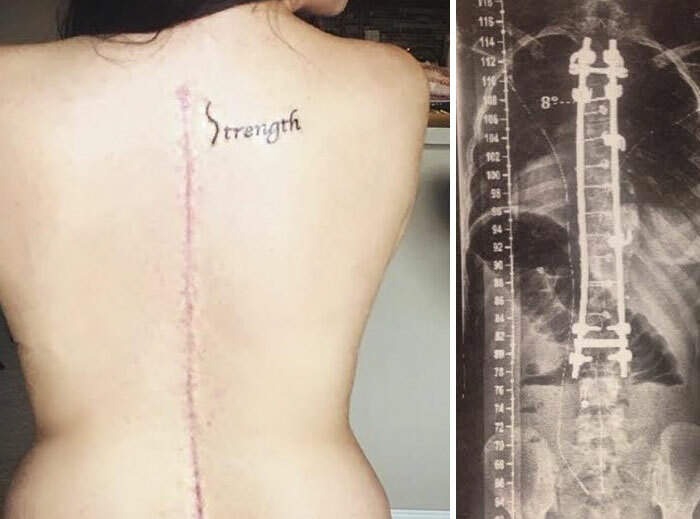 She was diagnosed with Severe Scoliosis when she was 15 and a hard time started. She needed a very invasive surgery to live into adulthood. This tattoo is the image from a textbook. Her spine never looked like that and never will. 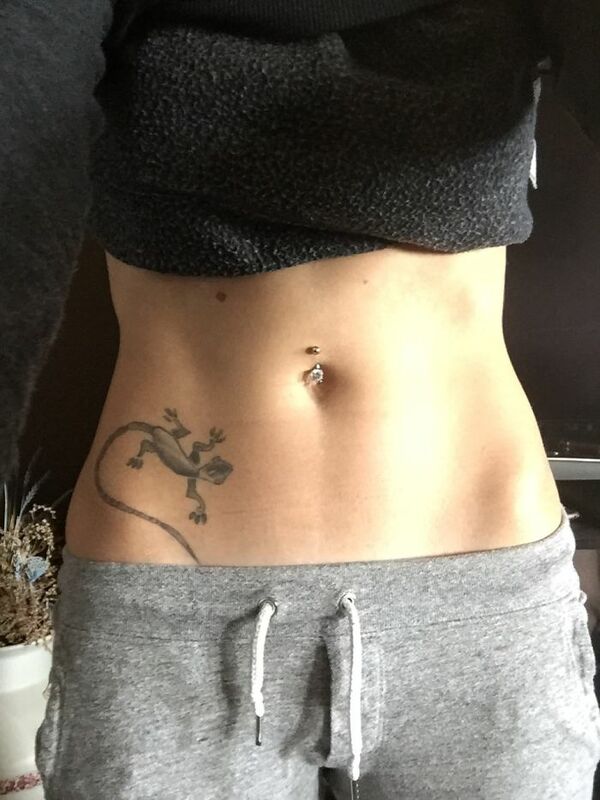 She had scars of self harming because of body shaming issues which drove her to depression. This lion represents strength and overcoming her own struggle. You can’t see the scars underneath that gorgeous lion. Everyone acted like there was nothing wrong, until one day her little brother asked her about those self-harming scars and she was so ashamed she decided to turn her life into something amazing. Itsumo means Forever and the heart represents the family. She wanted to tell the world that her strong hard and strong family will hold her forever, and that those self-harming scars are no longer a part of who she is. The phrase “A time to Mourn A time to Dance” on top of some of the scars on her wrist from when she used to self-harm in the midst of an eating disorder shortly after her lupus diagnosis when I was 16 years old. She got injured when she was 16 and a big scar remained. She then decided to cover it up with this anchor, that also remembers her grandfather, who served in the Coast Guard. 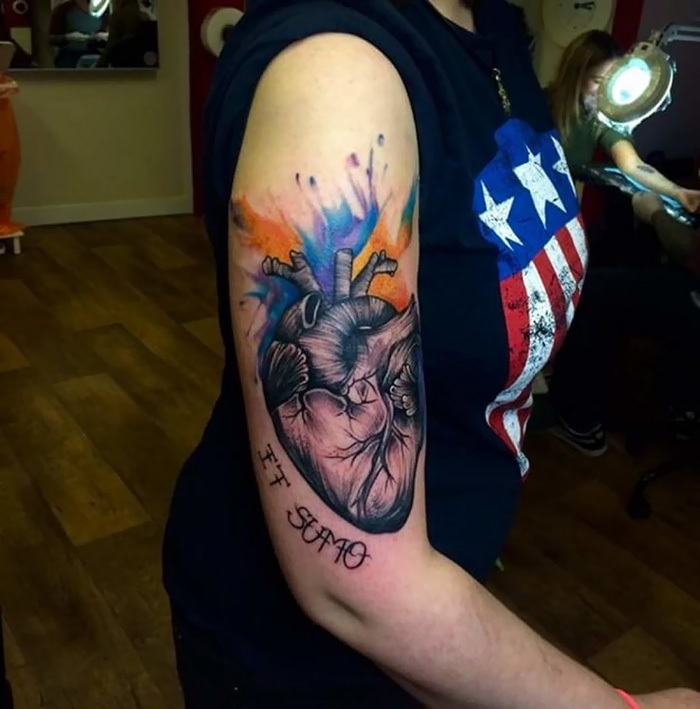 She found this design in a Tattoo Convention in Canada and just knew it was meant to be. She is proud that she could turn something ugly like self-harming into something beautiful like this. After cheating on her boyfriend, she started cutting herself on the wrists. When she overcame, she decided to get this tattoo to cover the scars, symbolizing the importance of self esteem. This guy covered up his nasty burn scars made with a lighter with the symbol of medicine, because he is a doctor, and a knife, to prove he is strong.